Theodore Roosevelt National Park. "I never would have been President if it had not been for my experiences in North Dakota," Theodore Roosevelt once remarked. 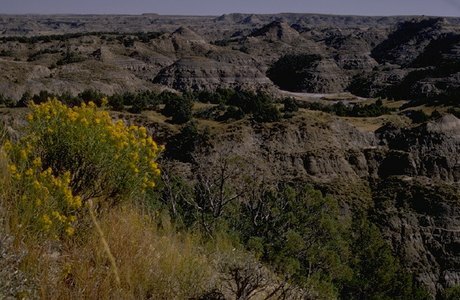 Whenever he managed to spend time in the badlands, he became more and more alarmed by the damage that was being done to the land and its wildlife. He witnessed the virtual destruction of some big game species, such as bison and bighorn sheep. Overgrazing destroyed the grasslands and with them the habitats for small mammals and songbirds. Conservation increasingly became one of Roosevelt's major concerns. During his Presidency, Roosevelt established the US Forest Service and signed the 1906 Antiquities Act under which he proclaimed 18 national monuments. He also established 5 national parks, 51 wildlife refuges and 150 national forests.